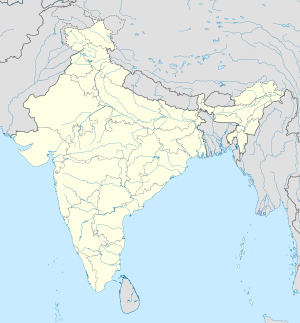 Narendrapur is a locality in Rajpur Sonarpur Municipality of South 24 Parganas district in the Indian State of West Bengal. It is a part of the area covered by Kolkata Metropolitan Development Authority (KMDA). Narendrapur is situated in the right beside of Adi Ganga. It is the home of a famous school and college founded by Ramakrishna Mission. Narendrapur is located at 22°26′21″N 88°23′48″E﻿ / ﻿22.4391°N 88.3968°E﻿ / 22.4391; 88.3968. It has an average elevation of 9 metres (30 ft). Narendrapur railway station is 15 km from Sealdah railway station on the Sealdah–Sonarpur line of Kolkata Suburban Railway. It is connected by road to Garia and the E.M. Bypass. Narendrapur's road system connecting the region is mediocre, and largely present in the region are auto rickshaws that travel from Garia to Baruipur. Ramakrishna Mission Vidyalaya, Narendrapur is a branch of Ramakrishna Mission. The institute has its services open to all irrespective of caste, creed and nationality. Its special field is education. Started in Pathuriaghata, a North Calcutta neighbourhood immediately after the Bengal famine of 1943, it first served as a home for the poor and orphaned boys. Since its relocation in 1957 to its present site in the southern suburbs of Calcutta, near Garia, it has grown into a huge complex with varied activities. It has more than 2,000 resident students and occupies about 150 acres (0.61 km2) of land. Certain areas of the South 24 Parganas district have been identified as having poor ground water and contamination. Specifically, ground water is affected by arsenic contamination. ^ "Groundwater Arsenic contamination in West Bengal-India (19 years study )". Groundwater arsenic contamination status of North 24-Parganas district, one of the nine arsenic affected districts of West Bengal-India. SOES. Retrieved 24 August 2007.